Six Degrees, as an editorial platform that feeds into and out of New Museum programming by functioning as a space for expanded dialogue, research, and reflection, will be inviting different artistic, curatorial, and educational initiatives to consider their own structures and material conditions for production. In addition to sharing the work of such initiatives with our readers, the process of facilitating these discussions will also inform similar Museum programs. An educational and curatorial project, the Back Room draws upon various methodologies, such as pedagogical strategies, translation, and different forms of research, to facilitate collaborative artistic work that comes out of shared interests and urgencies, while also recognizes the specifics of place and context—concerns all central to Museum as Hub, a program housed in the Department of Education and Public Engagement. 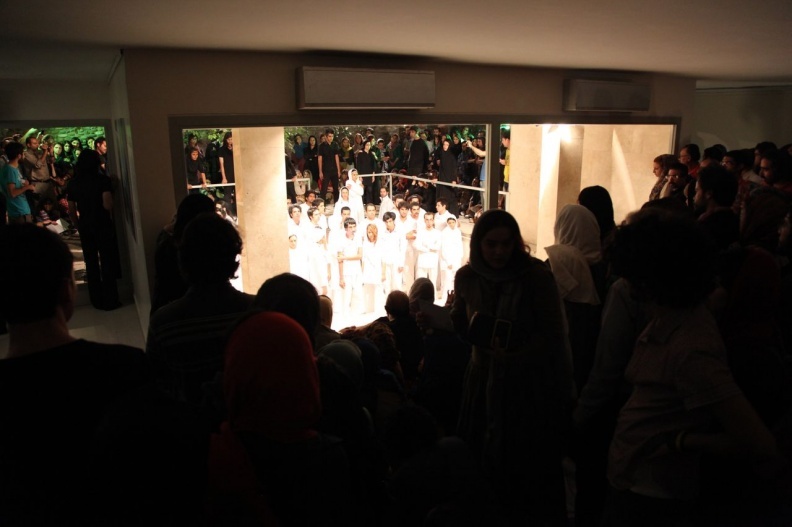 The Back Room organizes long-distance workshops, public programs, and exhibitions between New York and various cities in Iran. 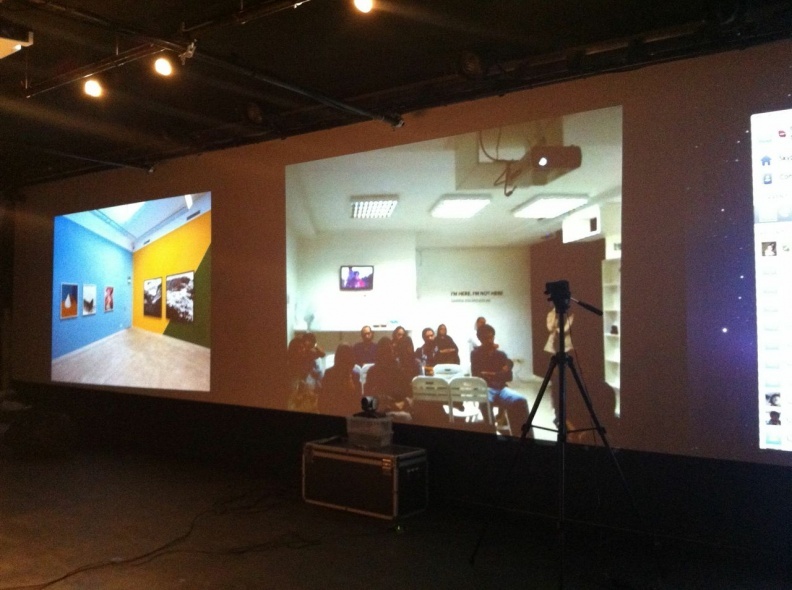 In late April, the Back Room will hold its first eight-week-long telepresence workshop, connecting arts spaces in Tehran, Isfahan, and New York (hosted by La Mama’s Culture Hub), where they will bring together artists and critics from the three cities for reading-based discussions on visual, performance, and media arts. In advance of their upcoming workshop, Six Degrees invited critic and art historian Media Farzin to speak with the Back Room Codirectors Ava Ansari and Molly Kleiman about the urgencies that motivated their project’s formation in 2010 and the questions that have shaped its evolution since. Digital technologies provide the Back Room with the means to facilitate artistic and intellectual collaboration across borders—not only crossing geographic boundaries and distances, but also sidestepping the social and political divisions caused by the Iranian government’s repressive regulation of the public sphere, and the US government’s economic sanctions against Iran. The Back Room borrows its name from private rooms used by Iranian galleries to host meetings in relative freedom, impossible in the more public “front” areas. The Back Room takes advantage of the interconnectedness and decentralization of an increasingly globalized art world to find new ways of grappling with the material divisions that continue to place restrictions on cultural production in numerous parts of the world. Media Farzin: How did the Back Room begin? What inspired the collaboration? Ava Ansari: In 2010, I moved to New York City to study at the Arts Politics program at New York University’s Tisch School of the Arts. Prior to that, I had spent a couple of years working at contemporary art galleries in Dubai and, previously, in my home city, Tehran. I had direct access to diverse art and scholarly resources that I wanted to share that with my fellow artists and art organizers back home. At the same time, I felt I was well positioned to work directly with the people who are residing and working in Iran to foster a more nuanced understanding of the art community and art-making for audiences in New York. Molly and I met soon after my arrival, and immediately connected in our shared interest in educational, curatorial, and editorial projects that employ digital tools for cultivating and facilitating artistic exchanges, conversation, and collaborations that would otherwise be impossible—due to physical distances or geopolitical impediments. Molly Kleiman: We were aware of the virtues the digital medium could provide, and also the effects it would have on any exchange. Through my editorial work at Triple Canopy magazine, I am often developing projects that use the web not merely as a default, but engage its properties—thinking critically about how the medium shapes the meaning, readership, and circulation of an article or artists’ project. I had never been to Iran. However, I had worked with artists in an area where visa restrictions and a recently violent past create obstacles for the cultural sector, having lived in Sarajevo for a few years. From our initial meetings, Ava and I recognized a shared sense of urgency and became excited about the possibility of drawing upon our complementary experiences to develop programming together. MF: Why did you call your project the “Back Room”? Is there a particular significance to the phrase? MK: As Ava recounted her experiences working in Iranian art spaces, I was struck by the strategies and tactics that she and others used to circumvent various impediments. AA: I described how there are often back rooms in these art spaces—a physical place where unsanctioned conversations can happen and artwork can be shown free of the complex censorship and surveillance that bureaucracies structuring the operation of Iranian art institutions impose. MK: We wanted to take this metaphor of the back room and open it up. We asked ourselves: How can we help develop an expanded, immaterial “back room”? How could such a backchannel provide space for a workshop? An exhibition? Technology can partially help us to manifest this. The features and limitations of this technology inevitably influence—and can even be the material of—artistic production. MF: Can you describe some of your early projects, and the motivations behind them? 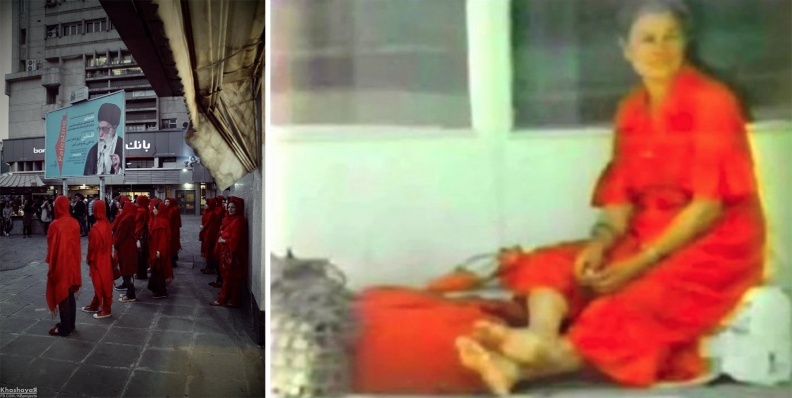 AA: The first phase of the project was driven by an urgent desire to take advantage of our professional and personal backgrounds, in order to create and sustain thoughtful and rigorous programming between Iran and the US that would also protect the safety of those involved, and be sensitive to the sociopolitical context. MK: Central to our effort is building relationships not only between here and Iran, but also among groups of curators, artists, and academics in different regions within Iran who are asking similar questions in their scholarship and practice, and helping to develop these partnerships. AA: Our first workshop as the Back Room was instigated by a conversation I had with Richard Schechner, the theater director and performance theorist. In 2011, he was invited to be a member of the jury for the 29th Fadjr International Theater Festival in Tehran, and to conduct a workshop with some Iranian theater groups during the festival. He and I discussed the ethics of accepting the invitation—weighing the virtues of accessing this community of young artists with the dangers of appearing authorized (thus instrumentalized) by the government. In the end, he decided not to go, but I was determined to find another way for him to still meet with some performers in Iran. MK: Ava and I, along with several other collaborators, developed this initial program as a two-day intensive including over twenty artists gathered in Silk Road Gallery in Tehran and fifteen artists who congregated at Eyebeam Art+Technology Center in New York. The conversation had started a month earlier, when all participating artists began sharing work on a closed online platform where we developed prompts for various interactions. It provided the opportunity for them to introduce their practice, form working groups, and develop proposals based on specific public sites in their respective cities, as well as propose collaborations and read texts by art historians and critics from both countries. During the workshop, Richard led some discussions and we facilitated a series of conversations over multiple computer consoles. It is essential for us to note our many co-organizers on this project: Bavand Behpoor, Sohrab Kashani, Anna Fahr, Anahita Ghabaian Etehadieh, Sahar Sajadieh, and others. AA: In the two years since then, we’ve organized several additional workshops and events in between different cities and locations in Iran and the US, including programs led by Wafaa Bilal, Shirana Shahbazi, and Shirin Neshat. MF: Have you encountered any issues that you’d consider specific to working with long-distance partners and audiences? I’m thinking of the perils of language barriers, mistranslation, or decontextualization of an artwork. How do you negotiate the inevitable gaps between a presenter’s knowledge and the audience or participants’ backgrounds and expectations? MK: We would certainly prefer to be sitting in the same room together. Dropped lines, frozen screens, and other technical hiccups are always present. So, these mediated encounters demand patience. For each project, we always work with individuals in Iran who we deeply trust as our direct collaborators and co-organizers. For a workshop, that means fostering a safe space, facilitating discussions, and taking the temperature of the group. For an exhibition, that means helping us to interpret and enact the instructions of an artist in concert with a gallery owner, technical team, performers, etc. Yes, it necessitates mutual trust. AA: We do our best to develop workshops and public programs based on the needs and desires of participants. This involves a considerable amount of preparation and discussion with partners in various cities. After organizing several one-off workshops over the past two years, we are currently developing a more sustained and extended education program, in partnership with La MaMa experimental Theater Club and Culture Hub, New York—an “incubator” for multimedia performance-based works. This program will last eight weeks in the summer of 2014, and use the technological resources of Culture Hub to facilitate lectures in partner spaces in Tehran and Isfahan; we plan to extend the program to Shiraz and Mashhad in its second season. Iran is a country of over seventy-five million people, of diverse ethnicities, who speak many dialects. The foundation of the Back Room’s city-to-city programing in Iran is based on honoring this ethnic and cultural diversity, while working against the tendency for Iran’s artistic activities to be defined by the salient trends in the capital, Tehran. We are interested in exchanging artistic concerns and investigating potentially shared threads amongst different cities within the country. This approach attempts to fill voids of understanding—which are deepening due to lack of support for independent research, an absence of reliable statistics, the censorship of the press and educational material, and economic strains—with direct conversations. I believe artists and writers have a role to play in examining the present and positing alternate futures. This is not to say that we are only interested in artists engaged in social practice or political action. Ultimately, our aim is for workshop facilitators and participating artists in these cities to continue their exchanges independent from our programming—extending the collective back room. And in several cases, this has already happened as artists who’ve met in these workshops have gone on to collaborate on future performances and installations. MK: In conjunction with our education program, we are developing a reader that will include texts on performance art and new media translated from English to Farsi, and Farsi to English. 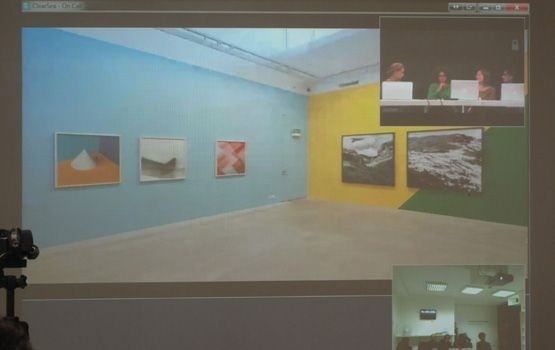 This will be a way of developing a shared vocabulary among participants, discussing currents in contemporary art outside and inside of Iran, and also looking at terms from each language that have no direct translation. MF: There has been a great deal of unqualified praise (and, in response, cautionary criticism) regarding the liberatory promise of digital technology, in relation to social movements in Iran and the Arab world, for example. Do you have a particular stance on this conversation? Do you see technology as transforming the way artists and performers and thinkers work, or do you see it more as a tool for enabling new circuits and new exchanges? Related to the above—do the artists (and thinkers, writers, performers) that you have worked with take up the mediums that enable the exchange explicitly? Do they deal with digital or virtual questions in their work, for example? MK: Yes, we are bombarded with trumped-up techno-utopian language—and I find that people are guilty of such pronouncements in every country. Ava and I appreciate what the technology can provide us—these conversations are not surveilled as a public talk would be, telepresence demands no visa—and we are still critically aware of how it is wielded, how it shapes discourse. AA: One example of our collaborative remote curatorial practice is A Call (2011), a performance by Wafaa Bilal that we curated in collaboration with choreographer Sara Reyhani and director Hamid Pourazari, enacted by more than eighty performers at Aaran Gallery, Tehran, and concurrently projected onto a wall at Whitebox Art Center, New York. (We discussed the development of this project in our conversation “Being There,” published in ArteEast.) Subway (2011–ongoing) is a recent and ongoing artistic and curatorial project developed by the Back Room that uses new technology as a material and engages cellular phone networks as a distribution method. It includes a video, a freely available Android app, and an archive of hundreds of still images collected from participants across Iran. MK: The project began when digital media scholar Michael Nitsche—who we had initially met during our first workshop—invited us to offer a “design challenge” to his class at Georgia Tech. We screened Ava’s video Dancing By Myself in Public (2011) that documents her improvised, responsive movements along a subway platform in Times Square. AA: I was interested in translating my public dance in New York—covertly, collectively—into public spaces of Iran. Dancing is forbidden there, but striking a still pose for a snapshot is not. In collaboration with Andrew Quitmeyer, Nitsche, the Digital World and Image Group, we developed an app that rotoscoped my dance, capturing stills, which would appear as silhouettes in the user’s cell phone camera. The project was introduced at an underground event hosted by a nonprofit art space in Tehran, and over a hundred anonymous participants took part. The app has two modes: one for reenactment and one for freestyle. Regardless of mode, the participant stages their own image, while location and stance become visual codes. The project was named Subway, both after the location of the initial dance and as a fairly ubiquitous title that would help the project’s collaborators maintain relative anonymity. MK: The forbidden act of public dancing masquerades as a mundane activity. When does a gesture or the adjustment to strike a pose become a dance? The project subverts the social norms and legal imperatives that define what is permissible to do or watch, pointing to the capriciousness and absurdity of such laws. AA: The project asked, how can we recode our movements and our environment, outside of the authorized norms? What is an ethics of looking? How can digital performances become a staging ground for protest? MF: In an earlier conversation, you mentioned a project inspired by a 1970s Iranian publication. Is that an upcoming project for the Back Room? 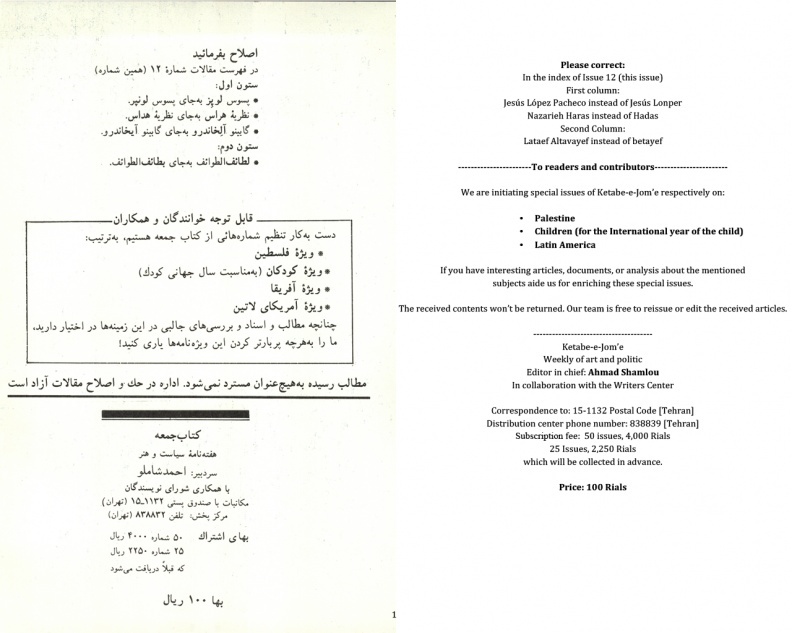 AA: About six months ago, we learned of an online archive of scanned issues of Ketabe Jom’e [Friday Book_, a weekly literary and cultural journal published between July 26, 1979, and May 30, 1980, in Iran. It emerged less than five months after the revolution and came out of a series of private roundtable sessions between writers, artists, philosophers, activists, and editors of the magazine, concerning topics in politics and poetics in Iran as well as beyond its borders. The conversations were recorded, transcribed, and edited by poet Ahmad Shamloo and his editorial team—becoming both content for the magazine and a catalyst for response essays and literary projects that were published in subsequent issues. I pored over this astonishing archive (currently only available in Farsi). MK: When Ava described Friday Book’s publishing model, it resonated with our ethos at Triple Canopy—it embodied an expanded notion of publication; it was a generative journal and constituted a community. Ava and I are currently working on a piece for Triple Canopy that will include translated excerpts of Friday Book along with annotations by, and interviews with, its editors and contemporary Iranian artists and writers. AA: We hope that, like the original Friday Book, our activities will account for diverse voices and be generative—each workshop, roundtable, or exhibition seeding new potential collaborations. Ketabe Jom’e [Friday Book], Issue 12, Back Cover, 3 Aban 1358 [October 25, 1979]. Friday Book is a weekly art and politics magazine that was published and circulated from 4 Mordad 1357 [July 26, 1979]) to 1 Khordad 1359 [May 22, 1980] in Iran. It is the subject of a new research project by the Back Room, which is investigating its approach to magazine as a medium and as site for creating and cultivating community. MF: Do you look forward to the Back Room someday being a sanctioned and more official type of institution? Or do you feel it in fact works better as an informal, modest, and context-specific intervention? 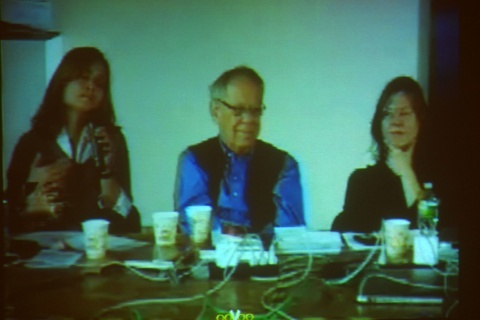 AA: We discuss this often ourselves, for example: Would we want to ever become an official nonprofit entity? Would we ever want a physical space of our own? MK: [laughing] Ava has always been talking about setting up a storefront. And I always push back! There is virtue in being nimble. AA: And, more importantly, we prefer to be unaffiliated. This enables us to stay flexible—working with a variety of spaces, including nonprofit arts organizations, commercial galleries, and even unpublicized collectives. We balance a desire for publicizing our activities and the activities of our partner artists with protecting their safety. MK: Since Ava and I first met, we have discussed working with locations outside of Iran, where artists are also facing economic and governmental constraints. So, we imagine that future programing might bridge art communities in additional countries. We think of the Back Room as a way of working rather than a geographically specific endeavor or a fixed entity—expanding, redirecting, and querying our activities. Ava Ansari, Dancing By Myself in Public, 2011. Video documents Ansari’s improvised, responsive movements along a subway platform in Times Square—performing gestures and interactions that would be illegal in her native Iran.